Mert is both an artist and engineer with a sincere passion to design and produce elegant engineering solutions for the needs of humanity. 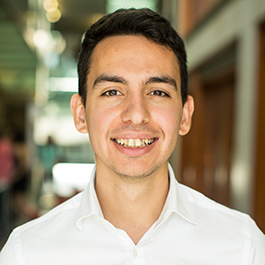 Before joining the EDI program, Mert embarked upon various engineering design projects including a yearlong interprofessional project, named Mobilus. He was given the opportunity to adapt solid mechanics knowledge into action while designing various physical therapy devices for hemorrhagic stroke patients. Mert also had the opportunity to work as an Engineering Intern/R&D Technician at VISAYA, a start-up company owned by Ayalytical Instruments Inc. There, he polished and utilized his 3D CAD modeling and designing skills while acquiring hands-on experience in a work environment. Mert is excited to be in the EDI program because he believes it will help him combine aesthetics with engineering and create solutions. He believes that there can be no real solution without understanding the user, and therefore, it’s mandatory to learn and practice human-centered design. Mert wants to learn more from the EDI faculty and advance in the world of design engineering. Ultimately, he wants to make a positive impact as he searches for unique solutions for the needs of everyone.